First, choose what kind of chowder we are aiming for: Manhattan or New England. Both start by cooking bacon, then sautéing onions in the bacon fat. Clam juice, diced potatoes and sometimes celery are added next. To this mélange, Manhattan chowder folk add diced tomatoes and tomato juice, while New England chowder folk add milk, cream, or some combination thereof. Clams are added last to prevent overcooking. The essence of clam juice is the sea. For taste of the sea we will use seaweed. I suggest a combination of kombu dashi (giant kelp broth) and crumpled nori (the sheets of laver wrapped around sushi rolls). Kombu will serve two functions here: 1. Provide seafood flavor. 2. Provide umami. The two most obvious ingredients to provide the chewy, meaty nature of clams are sautéed mushrooms and seitan, or cooked wheat gluten. I’d use both. Mushrooms have a great texture and are also high in umami. I’d sauté them and add them to the seaweed broth (along with some dried mushrooms if you’d like) to make a seaweed/mushroom-stock combo. Seitan is a dough made with vital wheat gluten that’s poached in a flavorful liquid (I recommend using your seaweed/mushroom stock). Next we need to add the smoky notes of bacon. You can either smoke a component of the soup — the potatoes, the seitan, etc — or add liquid smoke. Believe it or not, liquid smoke is not fake — it’s made from real smoke that has been treated to remove potential carcinogens and other nasties. Industrial food producers have access to some very high quality liquid smokes that taste quite good (I’ve tried them). Unfortunately, most supermarket brands have been altered to the point that they provide a monotonic, very obvious “liquid smoke” flavor –think of them as skimmed smoke (PS. That is a jab at skimmed milk, which I hate). You can buy a high quality smoke powder made by spray drying liquid smoke from Terra Spice. Use powdered smoke sparingly; just like real smoking, if you go too far your food will become bitter. I find this sort of thing to be very interesting, since I am still very much a recipe based cook... and seriously wonder if I'll ever get to the level of competence and confidence where I could rattle off something like this. It also makes me wish that on a show like Iron Chef they would show you when they're brainstorming what dishes they're going to make (clearly they don't just make them up on the spot)... though I suppose that would ruin some of the suspense. 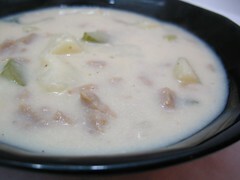 Another delightful variation for Clam Chowder recipe. It is very interesting how this combination of ingredients taste like. This clam chowder recipe looks like already a complete meal. Why not serve it with rice and some steamed veggies to have a nice dinner.